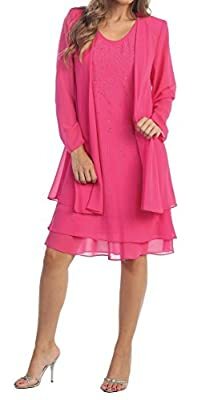 Lovely chiffon mother's, church or social event dress with jacket. Can be worn over and over for a variety of functions. This gown is made in the USA and ships from the USA! Chiffon with matching, removable jacket. Please be aware of poor quality Chinese copies. Check the seller location! Belle Maids ALWAYS ships from the USA. Hand beading accents this fun, but conservative style with wide tank straps and high back neckline. PLEASE use size chart to the LEFT under the small pictures. Expect and plan for alterations for a perfect fit. If you need help with sizing, please contact Belle Maids and we will be happy to assist you. Formal gowns run at least two sizes smaller than off-the-rack dresses. PLEASE take your measurements prior to ordering!